All our students have the opportunity to conduct original research as part of their degree: most students in their third year will write a dissertation, an original piece of work, under the supervision of a member of staff. But there are also numerous other opportunities for undergraduate research available, whether through participation in archaeological excavation, getting involved with our annual Drama Festival, contributing to our departmental blogs, or working on a project over the summer funded by the Undergraduate Research Support Scheme (URSS). The URSS funds students to work with staff on original research projects, or to pursue their own research. These opportunities allow students to explore their interests more fully, and to develop transferable skills along the way - e.g. budgeting, planning, time management, experience in different ways of presenting ideas, collaboration, analysis of data. Opportunities for research experience are regularly posted in the departmental corridor and via email throughout the year. Hannah Thorpe, Becky Rolfe, Chloe Highton and Bethany Moreing have been awarded grants to work with Clare Rowan on an English translation of Rostovtzeff's Latin catalogue of Roman tokens, as well as an examination of the imagery used. The project will involve work on the unpublished collection of Roman tokens in the British Museum, as well as a field trip to Rome. Gemma Walton was awarded a grant for the project "Exploration of Classical Numismatics" and will work with Clare Rowan on the department's coin collection. Laura Mitchell was awarded a grant to undertake a comparative study of the display of Greek Antiquities in the British Museum and the Louvre, under the supervision of Zahra Newby. David Swan (supervisor, Dr. Clare Rowan) - The foreign Monstrosity in British Iron Age Thought. Read the resulting academic article here. way we see disability through history’ at St Andrews Undergraduate History Conference 'Innovation or Restoration: Calls for Change and Tradition in History', in February 2015, supported by IATL Student as Producer Research fund. She has also been invited to present her work at the British Conference of Undergraduate Research in Winchester in April 2015. 2nd year undergraduate Joe Grimwade has also been invited to present his work, following on from his URSS project with Clive Letchford during Summer 2014 at the British Conference of Undergraduate Research in Winchester in April 2015. Congratulations to Joe Grimwade, whose research on The Forgotten Art of Memory was presented as part of Posters in Parliament 2015 on 10th Feb 2015. Joe's research, conducted through the URSS scheme, examined the methods of memorisation recommended by ancient Greek and Roman orators, comparing them with the mnemonic techniques of modern performers and public speakers. Four undergraduate students (Bradley Waters, Michael Wrench, Matthew Ellams, Emily Morgan) were awarded an Undergraduate Research Scheme bursary to participate in an academic research project over the summer. They worked with Clare Rowan on the project The Beginnings of Empire, 168-27 BC, examining what provincial numismatic iconography suggests about how Roman power was represented and negotiated in Greece, Crete and Cyrenaica in the Republican period. They worked on the online database of the project, made research trips to Oxford and London, and worked in the British Museum. They jointly published an article, (2014) 'Experiencing the Republican Empire: a numismatic perspective’ (M. Ellams, E. Morgan, C. Rowan & B. Waters) in the Journal of the Numismatic Association of Australia 25: pp.55-67. Four undergraduates from our department presented their research at this conference of undergraduate research in May. Grant McCallum, How important is fatherhood in Virgil's Aeneid from a political and poetic standpoint? Congratulations to Sarah Irving for winning the 'Best Poster' of the conference competition. The two best posters produced by first-year students following their trip to the British Museum exhibition, Life and Death in Pompeii and Herculaneum, were very different in focus, with one analysing the journey of a loaf of bread from the fields of Campania to the House of the Stags at Herculaneum, and the other questioning whether or not a famous painting from Pompeii really depicts Bacchus on the slopes of Vesuvius. The trip to the British Museum and the competition was sponsored by the Institute of Advanced Teaching and Learning. The students learnt how to work together to produce a research poster on an object of their choice, which they had studied at the exhbition. Congratulations to the winners: Joe Grimwade and Alex Porter; Elly Lee and Anna Hepburn. Three undergraduates in the department (Laura Christophis, Frances Hoggard and Jessica Walker) were involved over the summer 2012 in helping to prepare data on metrology for the forthcoming major reference work, Historia Numorum, Siciliy and Adjacent Islands, of which Suzanne Frey-Kupper is one of the editors. They visited numismatic collections in the British Museum. They presented the results of their research in a poster. 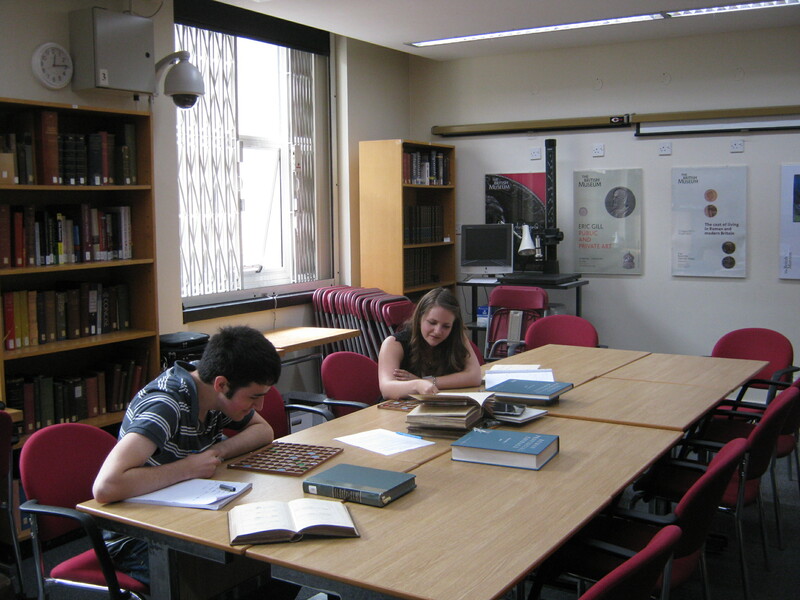 You can also find examples of our undergraduate research on the Coins at Warwick blog! Emily and Matthew working at the British Museum in 2013. 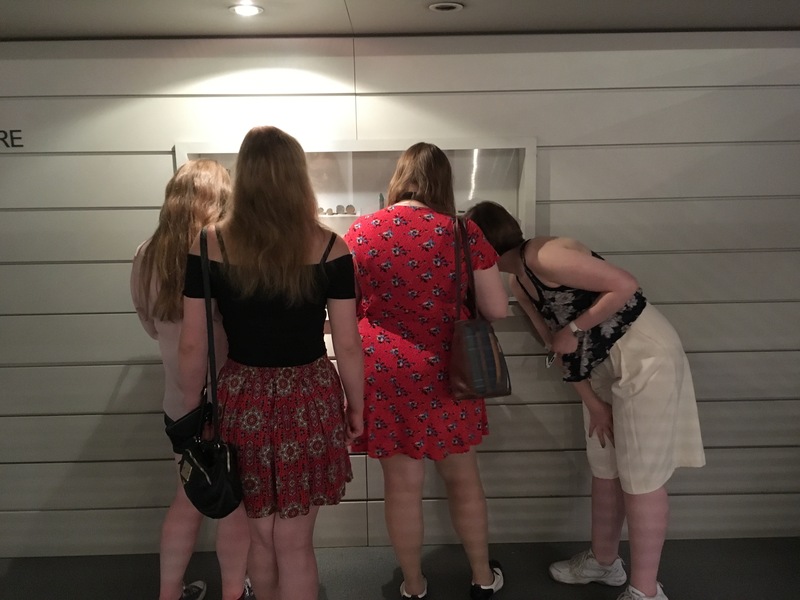 Students in the Capitoline Museum in Rome in 2017.